When I first saw this recipe in Closet Cooking, I tried it that very night. I make steel cut oatmeal for Zane most every morning, but I do it in the microwave. The microwave method takes at least 12 minutes, so I was eager to try this technique and wake up to hot, ready-to-eat steel cut oats. This recipe made enough to feed Zane 3 mornings in a row. I kept the leftover oatmeal in a ziploc bag and reheated each morning’s portion. After reheating, I added chopped walnuts and syrup, and Zane said it tasted just as good as the first day I made it. Zane gave this recipe the thumbs up and said it makes steel cut oats “much more palatable.” He loves the cooked apples and also prefers the softer consistency of this version to the nuttier texture of the microwave version. Closet Cooking gives the option of cooking the oatmeal directly in the slow cooker, but this is for cookers that have a shut off timer. My slow cooker does not, so this water bath/ bowl method is the one I used. My next version will be with blackberries – my favorite breakfast fruit. If you try this, let me hear how you like it! Put apples, oats, water, brown sugar, cinnamon, nutmeg & raisins (if using) in bowl that will fit into slow cooker with top closed. 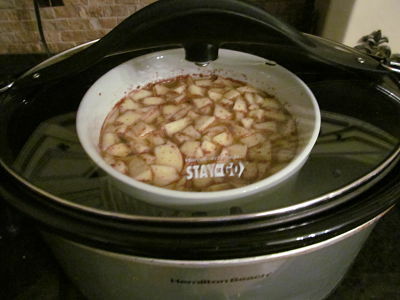 Fill water inside slow cooker to reach halfway up bowl. This prevents oatmeal from burning while cooking all night. Close lid. Cook on low all night. Mine cooked from 10:00 p.m. until 6:00 a.m. and was perfect. 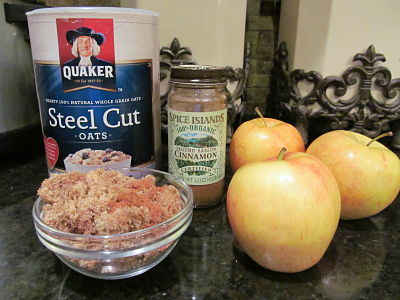 I used these 4 ingredients – steel cut oats, apples, brown sugar, and cinnamon – for cooking the oats. Before serving, I added chopped walnuts and maple syrup. It took several tries before I found a bowl that would fit into the slow cooker with the lid closed and that would be deep enough for the cooked oats (they puff and rise during cooking). This round, deep bowl was just right. I added water to fill halfway up the side of the bowl. I turned the slow cooker on low, and off to bed I went. 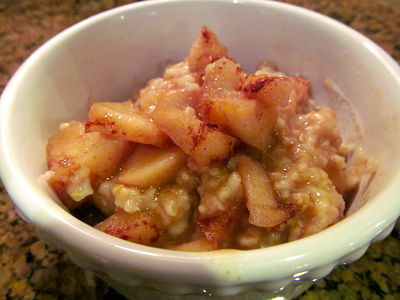 This is what I woke up to the next morning – a huge bowl of piping hot oatmeal with cinnamon apples on top – ready to serve. I was thrilled. 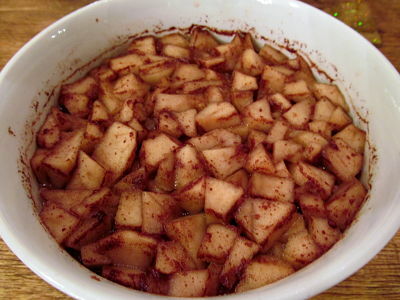 This recipe could be even more “apple pie like” by adding melted butter and some extra brown sugar to the mixture. It would decrease the healthy factor but certainly increase the flavor factor. This is how I’ll make this from now on. I love make ahead, and I love the reheating option. Tina, thanks so much for commenting, and please let me know how you like the oatmeal! We added lots more sweetener (via maple syrup) along with chopped walnuts. We thought it was great. I’d cook less than 8 hours if possible, as ours was very, very soft. Still good, but not nutty like traditional steel cut oatmeal. Blessings to you, my friend!